Design technology meets a white pair of briefs! This is the underwear suggestion today, the King Style brief in white. This is a pair that may look unusual but it certainly worths a try. 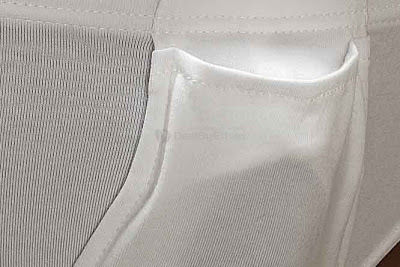 There is a mesh pouch and a tubular compartment that holds your you-know-what in position. The brand claims that this pair pays attention to the hygiene and comfort of the area helping prevent skin rashes, stickiness and bacteria growth. See the pictures below and especially the last one which describes this pair precisely. King Style’s underwear is likely to be the most unusual and exciting underwear you have worn. Designed to fit a man’s anatomy perfectly with a cool mesh pouch for your sack and a vertical, tubular compartment that holds your shaft in position. Unlike most other underwear, this avoids a wet and sticky feeling and the problem of skin rashes. King Style underwear has an ergonomic design without a tight feeling, providing men unparalleled comfort, a unique wearing experience and a healthier lifestyle.